What do I eat in Greece / Rhodes Island?? The prices are quite good compared to the rest of europe, so you wont spend a lot for your food... from about 20 euros per person will give you quite good quality for a lunch / dinner at a restaurant. Fish of course is much more expensive than anything else, and the cheapest but very tasty national fast food is Souvlaki, that will cost about 1.5-2 euros per item (2 will be enough for lunch for an adult). The traditional way Greeks eat out is usually by eating mezedes (appetizers in greek), that goes well with ouzo, retsina or beer, and is basically a set of appetizers with no main course, and everybody sharing everything which is set at the middle of the table. This way, everyone gets to eat whatever they want, in a great variety, cheap, and with re-fills at any time according to need... The appetizers usually are either Fish or Meat themed but not both. Fish tavernas you will find almost in or close to every beach... or fishing village, with usually local fresh fish (they will inform you if the fish is fresh or frozen). Meat tavernas you will find in most villages inland, and the meat is usually local and fresh. We will show you some of the local specialties here, to give you an idea and maybe start your appetite for the famous Greek Cuisine!!! Found in every Greek Table every day, the Greek salad is a healthy salad with many ingredients that ensure long healthy living!! It is served cold, and is refreshing, usually on the table just before the main course. It can also be consumed on its own as a full meal due to the richness and the variation of ingredients. Usually contains with order of importance: olive oil, tomatoes, cucumber, onions, feta cheese, olives, peppers, salt, pepper, oregano, vinegar. Optionally capers, rocket, cabbage. Some, need fresh bread to dip i the delicious juices that the combination of ingredients leaves at the bottom of the plate, that's why its always served at a deep plate. The Greek Salad has to be made at the time of consumption, and eaten right away, and cannot be eaten later, it loses its glory... You will find the Greek Salad at most restaurants, fairly priced for about 10 euros (for 2-4 persons). 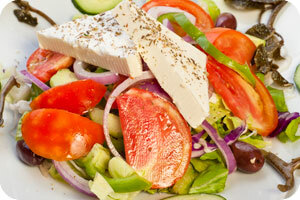 The Greek salad doesn't come at a personal size, as a complement it is shared between 2-4 persons. This is the most famous Greek appetizer, due to its simplicity and great taste! It is basically yogurt with garlic and cucumber. 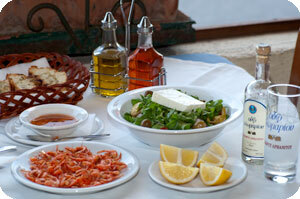 It complements most of the Greek lunches / dinners especially with meat or just appetizers. 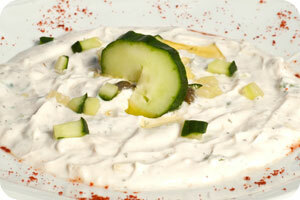 The ingredients are: Greek yogurt (it has to be 'stragisto' or thick texture Greek yogurt), cucumber, olive oil, garlic. It has to be cold when served, otherwise its not good. Can be complemented with olives. Its secret is on the yogurt, it has to be the special Greek yogurt Stragisto with the thick texture, otherwise it doesn't work! Tzatziki is one of the basic ingredients of the famous Souvlaki sandwich. Saganaki dishes are named after the special cooking pan called "Saganaki" which is a small two handle pan for frying. 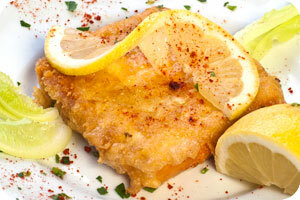 Saganaki Cheese is a very popular appetizer made with cheese, olive oil, flour and lemons. The cheese can be Kefalotyri, Cheddar or Pecorino romano. Very tasty and popular meze (appetizer) especially as an ouzo complement. You will find it at the Souvlaki places which have tables to seat. A favourite meat dish, usually complemented by french fries or mashed potatoes, or even pasta. Contains beef minced meat, bread, milk or water to soak the bread, olive oil tomatoes, garlic, parsley, eggs, oregano, salt, pepper. 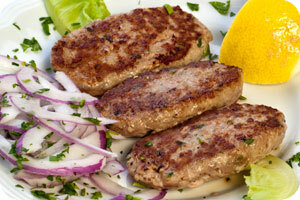 Variations include a mixture of different types of minced meat, from pork to lamb, or the addition of cheese filling. Found in most of the restaurants. 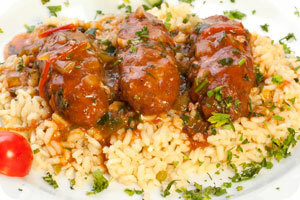 This is a very popular Greek dish, that if the cook is good, it is addictive... It can be consumed over a period of 3 days, some like to eat it the next day after cooking, some like it hot, while others like it cold. Found in many Greek restaurants, but not always. In the photo is seen with tomatoe sauce on top, but you will usually find it without this sauce, with a crusty cheesy surface. 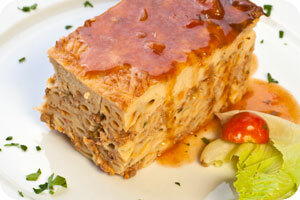 This is considered the Greek version of the Italian Lasagna dish, a very popular classic family dish. Can be consumed over a period of about 3 days or even more, and some people like it at least a days old. The main ingredients are pasta, minced meat and bechamel sauce. In detail the ingredients include for the meat sauce: minced beef, onions, bay leaves, garlic, tomatoes, olive oil, salt and pepper. For the pasta: Greek pasta (or bucatini or ziti), olive oil, egg whites, kefalotyri (or parmesan). And for the Bechamel sauce, milk, flour, kefalotyri (or parmesan), butterm egg yolks, nutmeg, pepper. Found in many Greek restaurants but not always. In the photo is seen with tomatoe sauce on top, but you will usually find it without this sauce, with a crusty cheesy surface. This is a Greek family favourite, because it can be consumed over several days without loss of taste. It can be a vegetarian dish or a meat lover's dish, with the addition of minced meat at the stuffing. The vegetables that are usually stuffed are Tomatoes, Green peppers, zucchinis, egg plants. The stuffing is made of rice for vegetarians or rice with minced meat for non vegetarian diets. The main ingredients are rice, olive oil, onions, mint leaves, parsley, salt and pepper, and of course the vegetables that will be stuffed. Usually their content is mixed with the filling for better taste. Found in many Greek restaurants but not always. 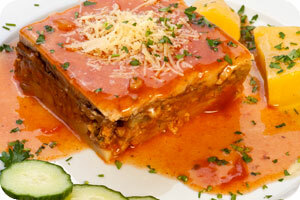 This is another favourite appetizer or even a main dish of the traditional Greek cuisine. 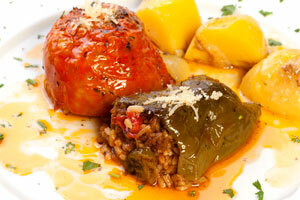 It is basically rice with or without minced meat, rolled by Vine leaves. The vine leaves give a special unique taste. This can be consumed over a period of days, and some people prefer eating them after they are at least a days old. The main ingredients are minced meat, vine leaves, rice, parsley, olive oil, and for the optional egg and lemon sauce: olive oil, butter, lemons, egg yolk, salt, pepper. The sauce is optional, and if eaten without the sauce, Greeks usually eat it with a complement of yogurt. The dish can be vegetarian when there is no minced meat in the filling, and it tastes just as good!! 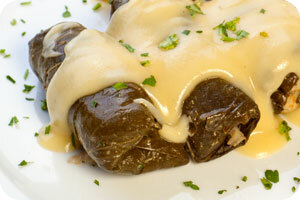 You will find ntolmadakia (dolmades) in many Greek restaurants. Soutzoukakia is another Greek favorite recepie, especially with kids, it is basically meatballs with red sauce, served with rice, french fries, baked or mashed potatoes. Found in many Greek Restaurants but not so much in fish restaurants. This is the most common way to cook fish here, the fresh fish (not all kinds though) are grilled at the restaurant's grill-house with natural charcoal. If cooked properly the fish should be juicy and very tasty! 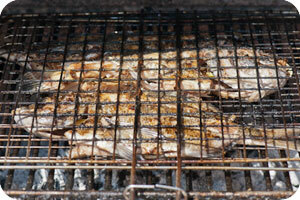 Tsipoures are the most common fish to grill, but Shrimps, Octapus and other fish are also very tasty and popular. You may have to wait for about half an hour before your food is ready, and even more in busy restaurants. In some restaurants, you can view / choose the fish yourself before they cook them for you. Ask about the price before you order fish, the prices can be quite high... They will usually give you a price per kilo, but you need to ensure you know how much the fish you will get weights..